How much is it fair to saddle a film with? Sometimes, heightened expectations mean reality will never satisfy. A Wrinkle In Time has been making headlines since it was announced that Ava DuVernay would become the first woman of color to direct a movie with a $100 million budget. It is also an adaptation of a beloved novel and employs one of the year's most star-studded casts. It had all the makings of a classic. But somewhere along the way, it seems no one thought to make sure the movie would be great. Whatever else you can argue the movie is--important, groundbreaking, earnest even--there is no argument it is great. It is staid and conventional at every turn, which belies the talent of everyone involved. Instead of the kind of timeless family classic, it is a largely forgettable standard-issue children's movie. In six months, we will never mention it again, which is a shame. Meg is a young bi-racial girl whose parents are scientists. Four years ago, her father discovered a way to travel the universe. When he is unable to find his way back, many speculate he will never return. As Meg faces bullying and a general apathy toward life, she struggles to cope with the idea that her father abandoned her. One day, Meg encounters mythical figures named Mrs. Which, Mrs. Whatsit and Mrs. Who. They say they can help her track down her father in the far reaches of the universe. Joined by her genius younger brother, Charles Wallace (played by Deric McCabe) and her friend, Calvin (played by Levi Miller), she sets off on a mission to reunite with her father and guide him back to Earth. If the premise reminds you of an episode of Dora The Explorer, you're not far off. So many scenes felt like they would end with a commercial break. Everything about it felt like a basic Disney Channel presentation. Beyond the star power and (often ugly) CGI, it is hard to see what exactly Disney spent so much money on. Makeup and hairstyling were major focuses, but it seems storytelling was not. Perhaps I have been spoiled by what Pixar seems to do with every effort--present child-appropriate stories with sophisticated messages that could provide discussion material for a university seminar. Nothing here rises to that level. Good and evil are black and white and the film has little interest in anything in between. The scope of its setting is the span of the universe, but it has almost nothing to say about anything that feels like real life. Meg overcomes obstacles in just the way you would expect and the film is never approaches anything that could be characterized as daring. Everything about the movie feels slight and cute. There is no major emotional heft or weighty moral questions. The movie rests on whatever you think about the 'otherness' of Meg. 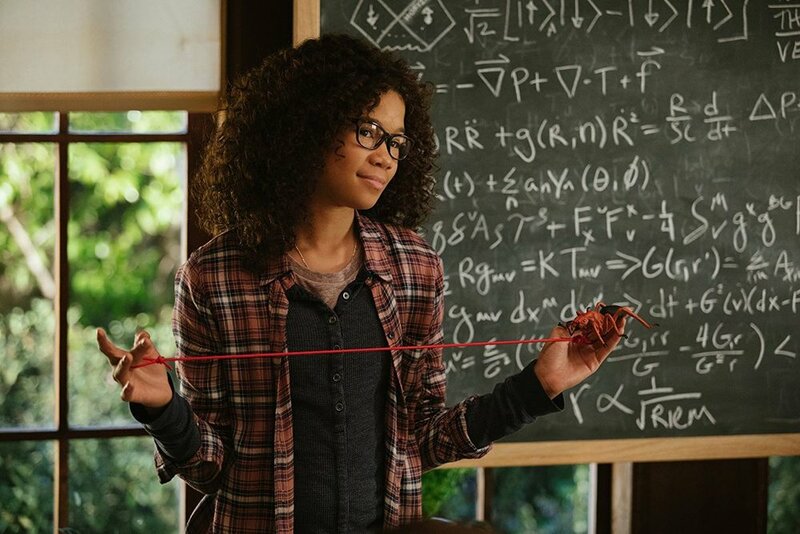 As a bi-racial girl who is brilliant in math, she represents a groundbreaking face of heroism. I do not take that fact lightly. The value of seeing her face in these scenes is potentially indescribably high. But if you are looking for just about any other reason to like this movie, you are unlikely to find it here.